A good example of how Greenwich council ignore problems, which then proliferate, is parking at Abbey Wood. Some pavements and parks have steadily become car parks. This may sound like a typical small town grumble, but the real issue is how their departments seem to fail to respond, and if a solution is presented, is often extremely flawed. For months, if not years, various people have contacted them about the parking. I see it on my twitter feed pretty much every day. People have contacted in other ways too – emails, and the fixmystreet website (which they encourage) and provided dozens of photos. Almost nothing has happened, and no one has been worried off by any ‘action’, as it’s still seen all over. Parking on pavements and pedestrian crossings is commonly seen, blocking disabled people and parents from some paths. Much of the parking is because want to avoid displaying a ticket in a parking zone, expanded a few months back at a cost of tens of thousands of pounds. But now, Greenwich council have finally come up with a plan. And it’s crap. They’ve sent out letters, and suggests they will act, but appear to conflate doing so with joining a parking zone, and then paying a fee. It appears to be some sort of coercion – we wont enforce rules and help pedestrians without coughing up some cash. This ignores the fact that many parking problems are already within areas covered by a parking zone where residents do pay (except if you park illegally and drive off-road and park on paving or grass it seems), and even where not, the council should be ticketing people blocking pedestrian dropped kerbs and paths as a matter of course. Not only doing so by insinuating that a fee must be paid to join a select area. Then it comes to who will be ‘enforcing’ it. Instead of using their own staff with greater legal powers, they are contracting it out to a private company notorious for bad behaviour. There’s also the issue that the private contractors have far less legal powers, and most of what they issue is not enforceable. Anyone who has watched a consumer TV show in the past few years knows private parking companies powers to fine are extremely limited, and almost never go to court. As a result, many people don’t pay the ‘fines’ and they are forgotten, so Greenwich’s outsourcing will likely do nothing for bad parking. But they’ll be paying a fee to a private company, after paying tens of thousands to install a parking zone which they don’t enforce. As they are millions down on where they expected to be in terms of parking income this year, why they can’t just send normal wardens to ticket selfish idiots I don’t know. It would raise income and aid vulnerable pedestrians. It seems they are suggesting they wont act unless you’ve paid for it, no matter how poor the parking, the effect it has, or even if the issue is related to a parking zone whatsoever. Similar issues present themselves there. Often it happens in the same spots on an almost daily basis. The cost to remove is high, so why not set up cameras in known areas? They are informed of it across various forms of media but little seems to happen. Councillors are often asking questions of departments, but its the departments themselves which are failing. And as it’s so many of them, it appears the internal culture is flawed and needs real reform. Failing to deal with continual parking problems, then coming up with a cack-handed plan, is symbolic of wider failings across the council. And yes, everyone thinks their council is the worst, and not all staff and departments are terrible, but from living, working and travelling in much of London, Greenwich really are poor in a wide variety of areas. 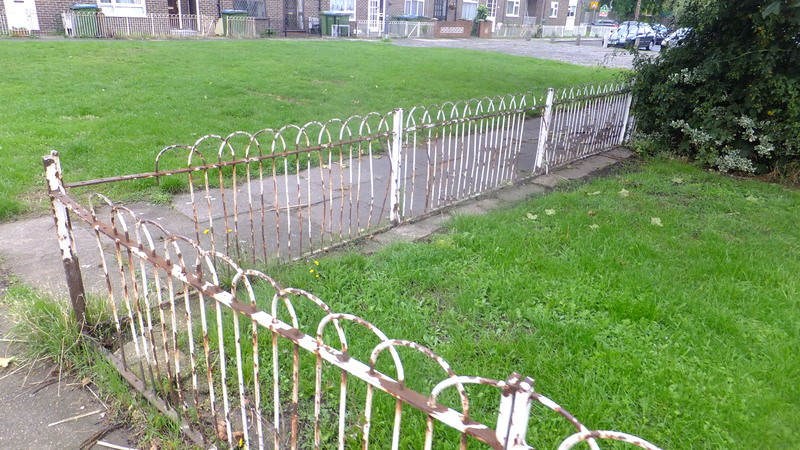 Council fence in public area. Pretty typical neglect. EDIT: Another visit today revealed more fly tipping in the same usual positions, and more cars parked on parks and blocking pavements. All in the same areas they’ve been told about many times. Greenwich council seem to do nothing. Others then join in, and more issues arise. The old broken window theory. Start to let things slide and a whole bunch of other problems take hold. This is matched by long term public realm neglect, and any attempt to regenerate the area becomes that much harder. It’s hard for many to have much pride or stake in a place so neglected, so they make little effort. I’ve been ignored on a few issues by the council and you really have to persist, but that wasn’t public. The fact they ignore people contacting them publicly with photographs shows they really don’t seem to care or are incompetent. Towns like Abbey Wood could be much better with a bit of council effort. It would be a domino effect; reduce litter, flytipping, parking issues and the ugly council buildings, and others would then not treat it so badly. A bit of effort over a short time is needed but seems beyond ‘Royal Greenwich’, unless in Greenwich itself. Sad to hear they still don’t care.